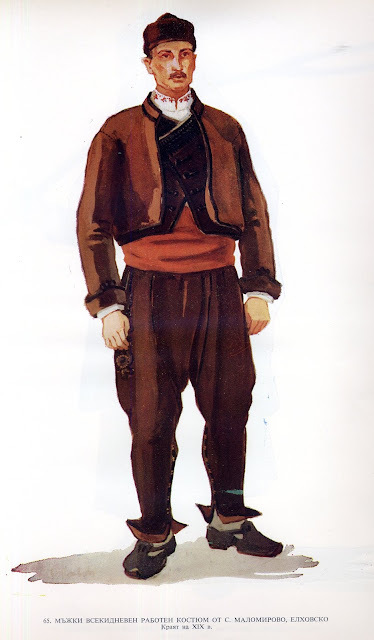 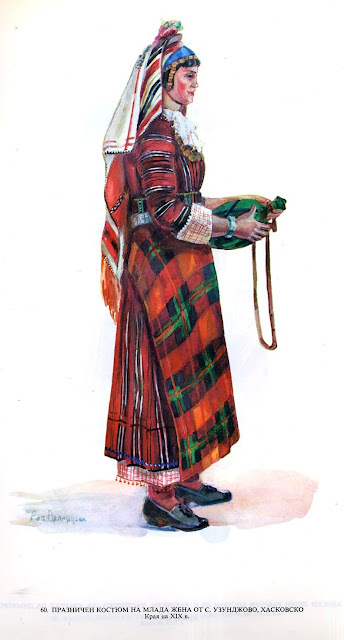 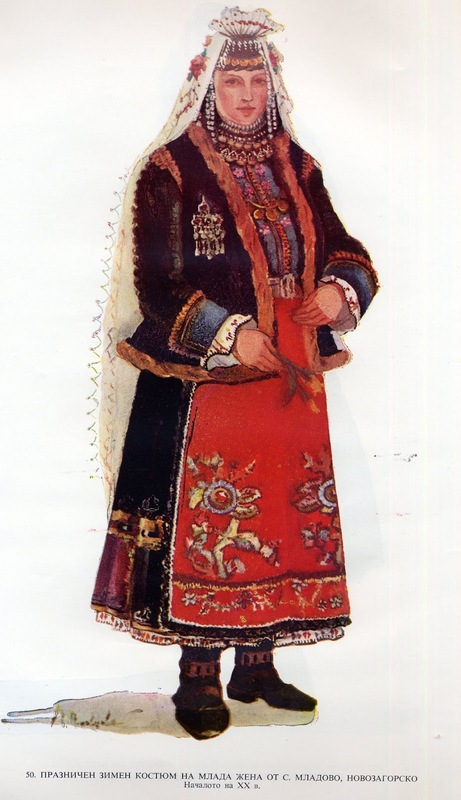 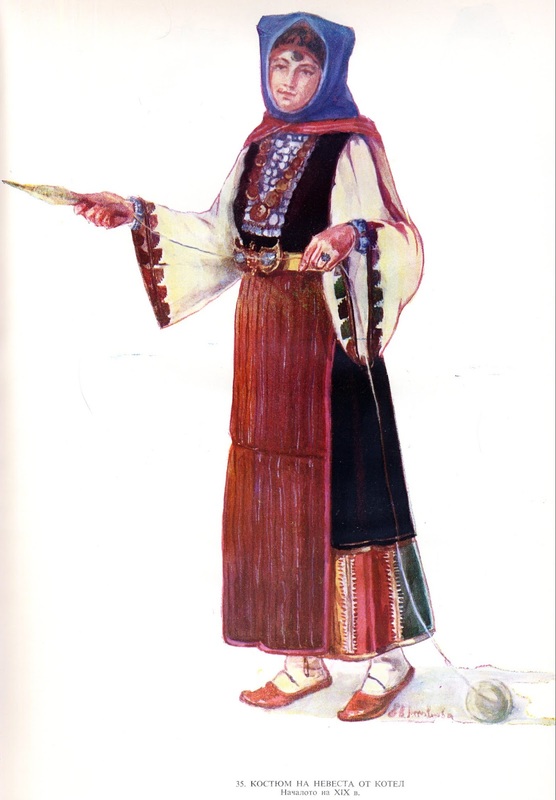 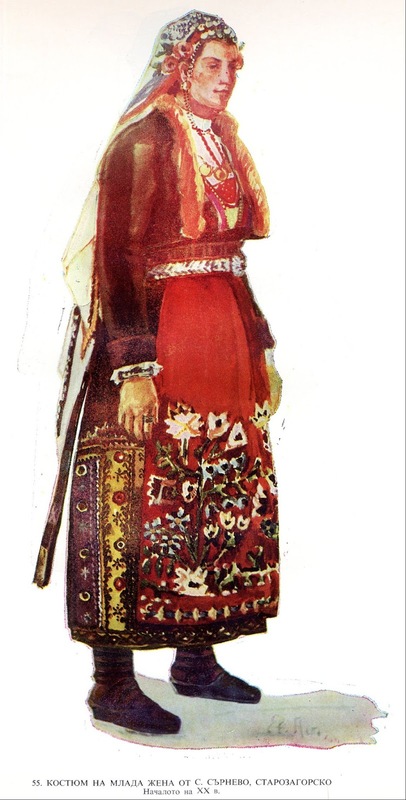 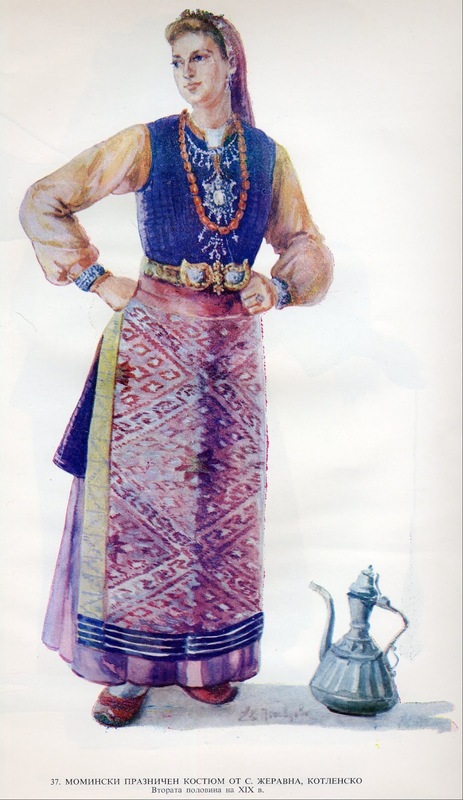 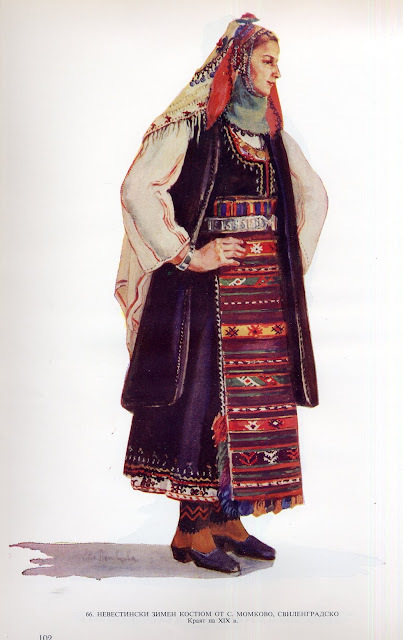 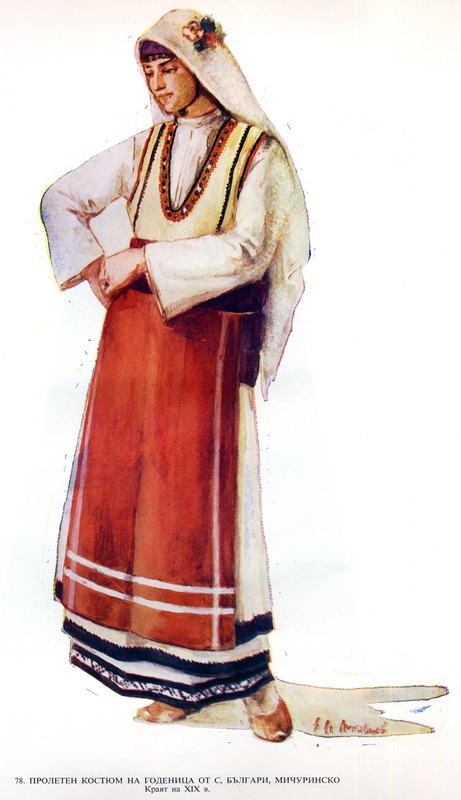 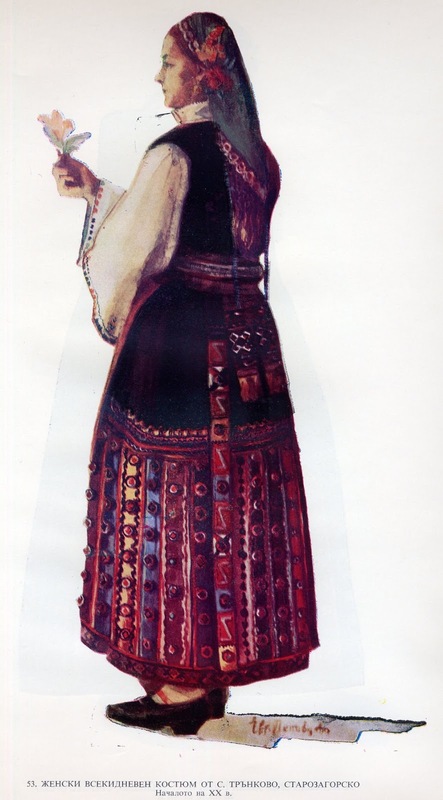 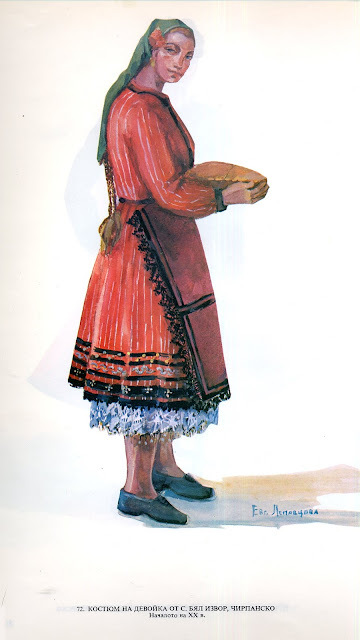 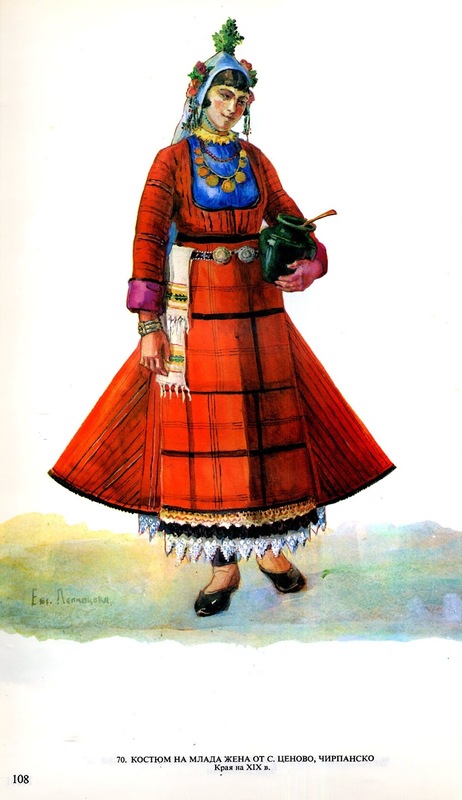 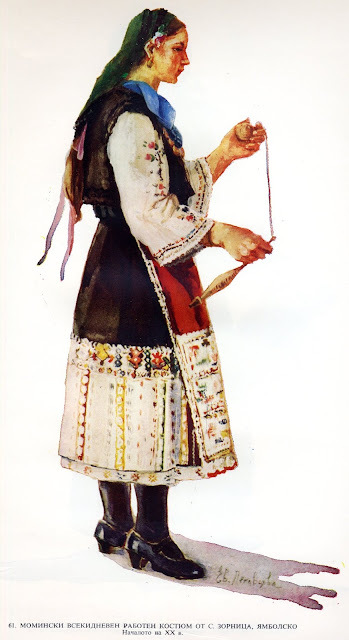 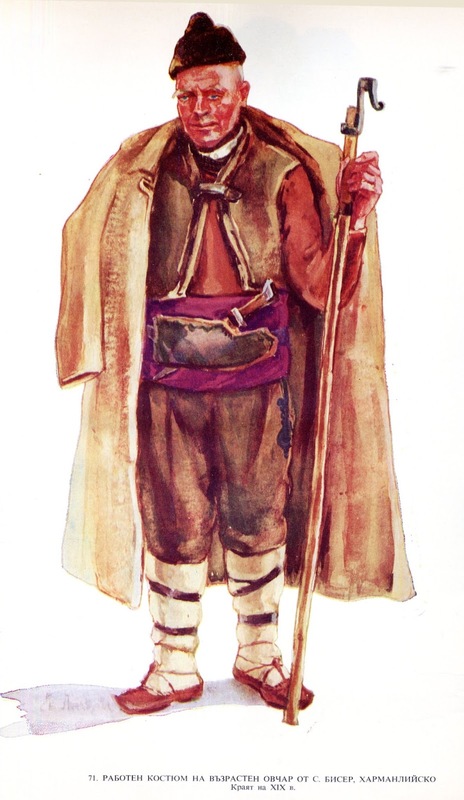 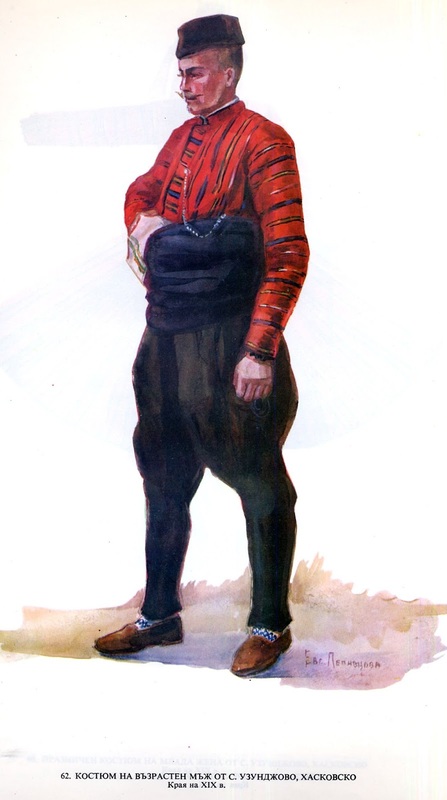 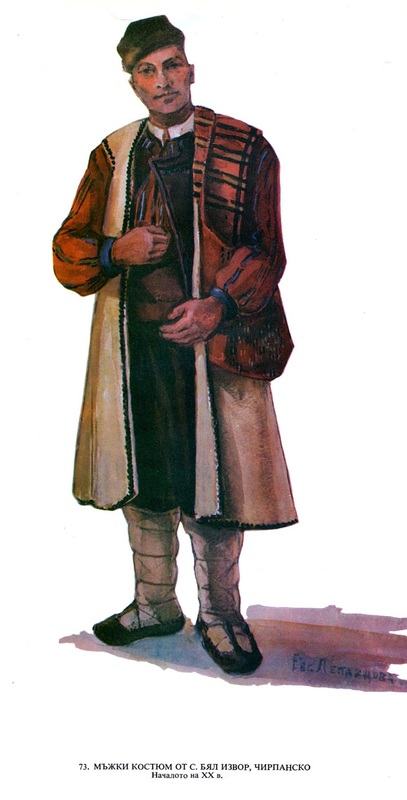 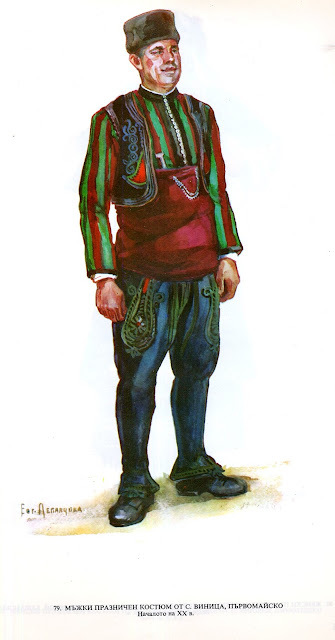 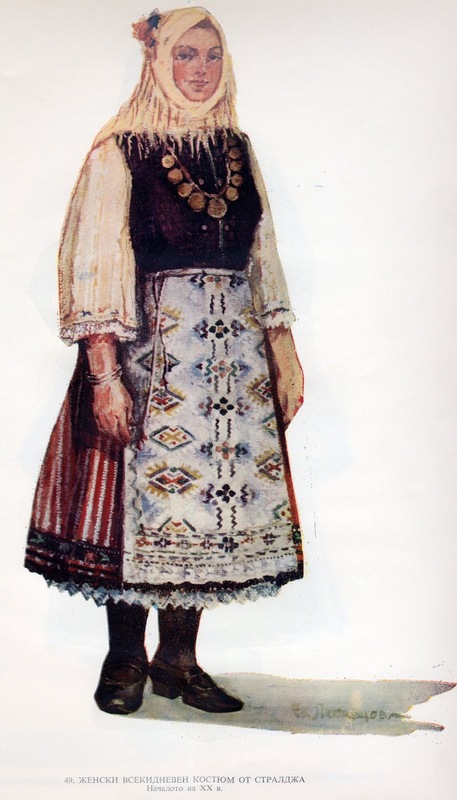 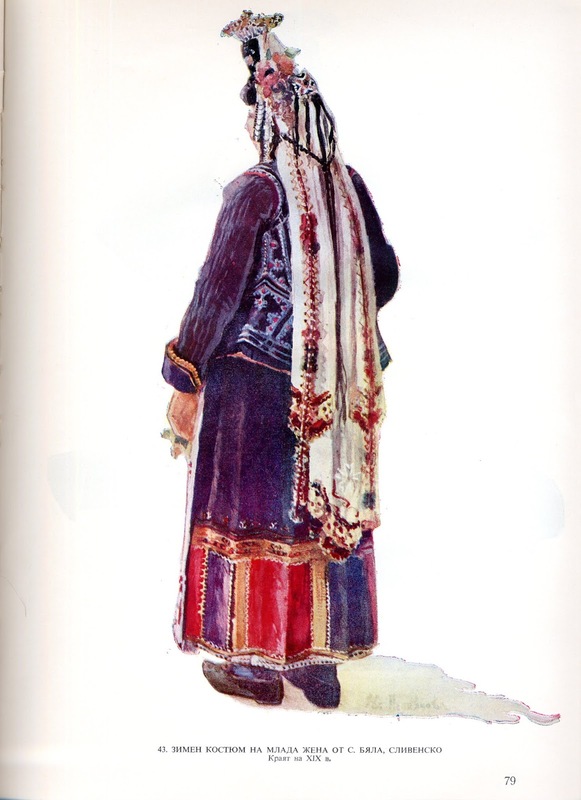 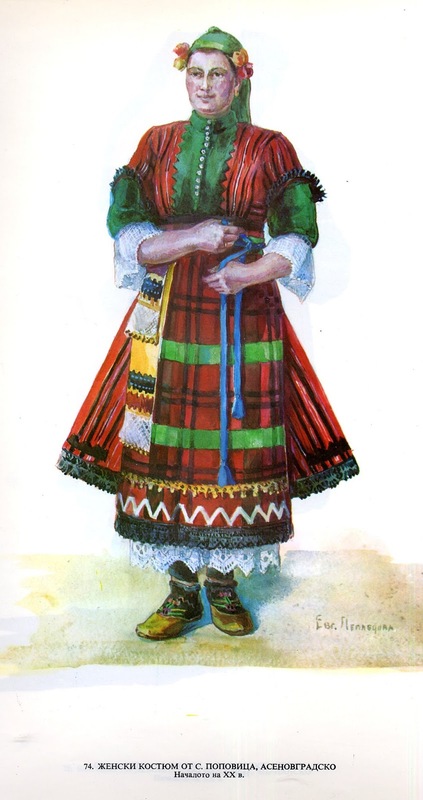 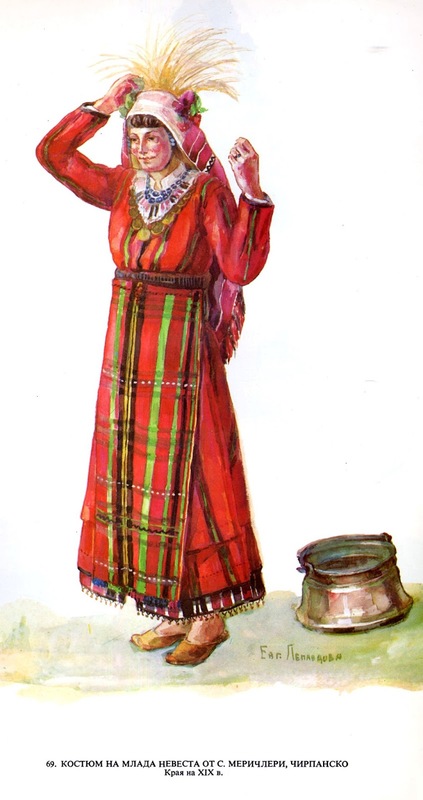 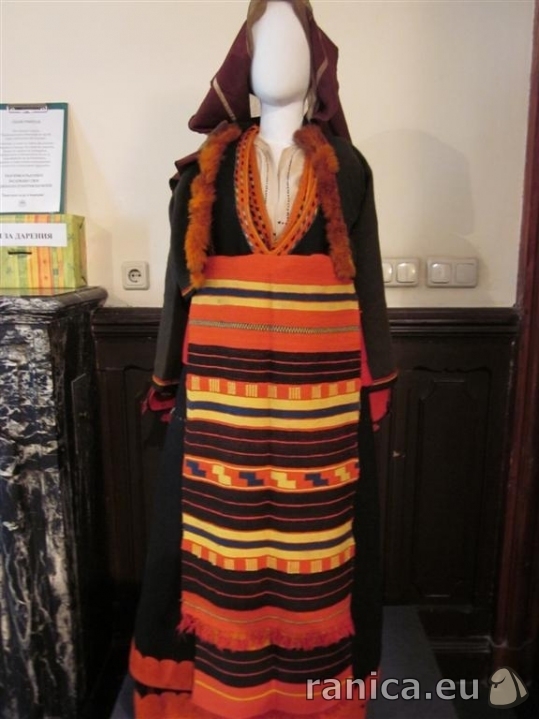 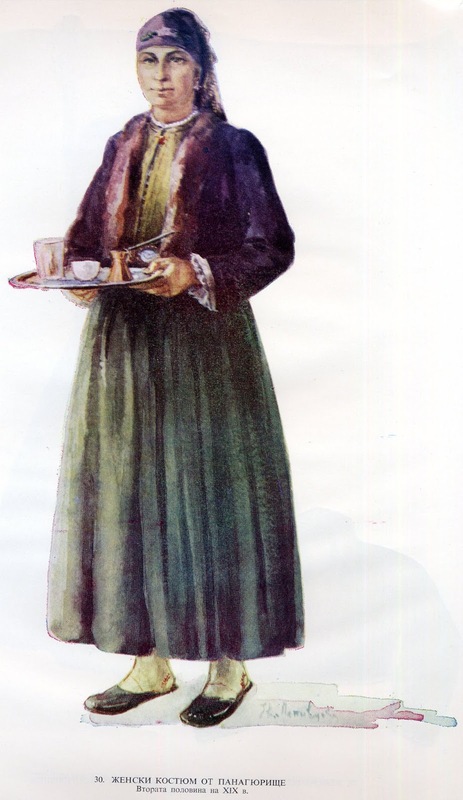 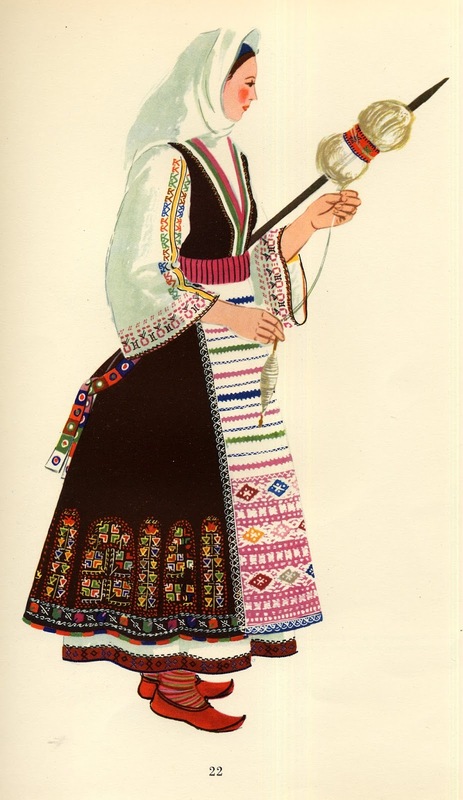 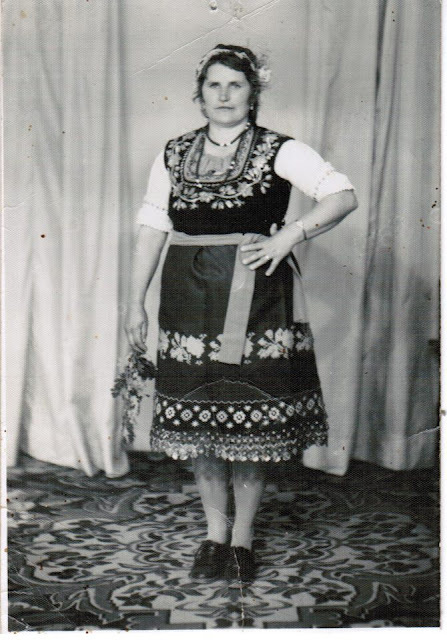 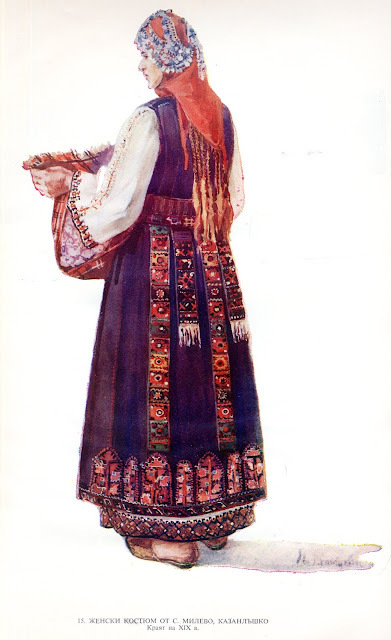 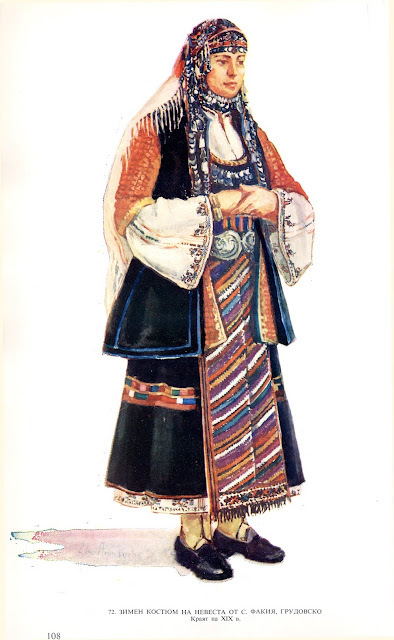 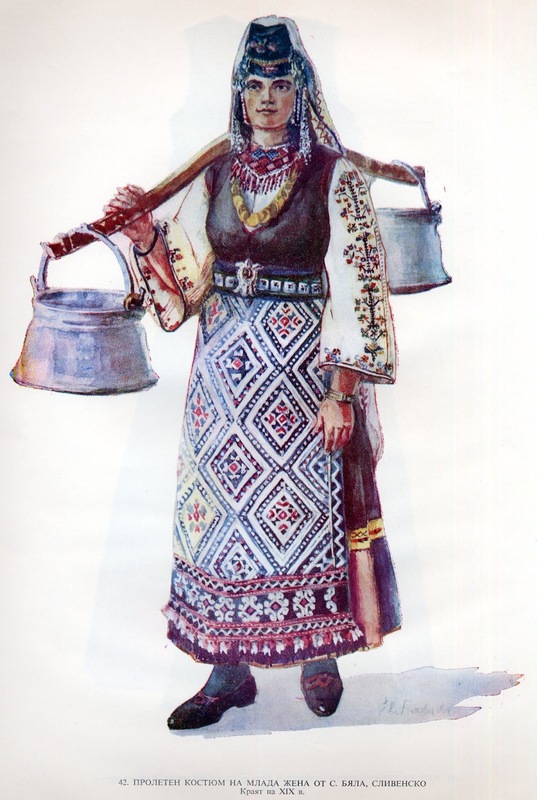 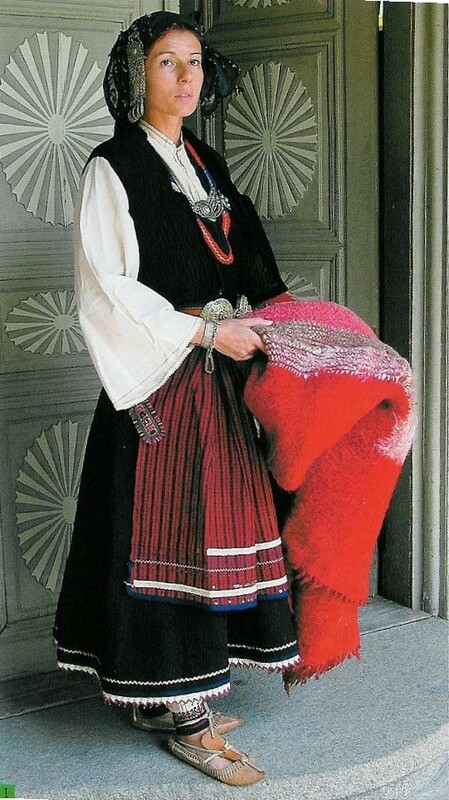 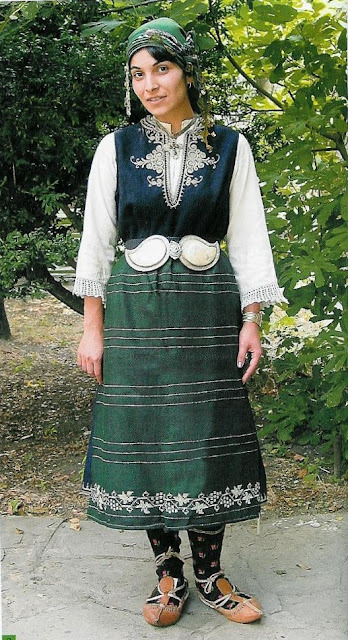 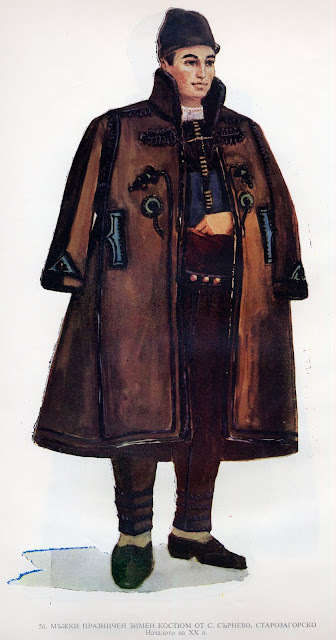 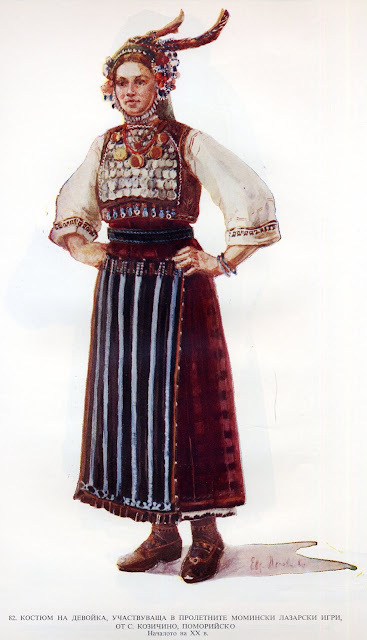 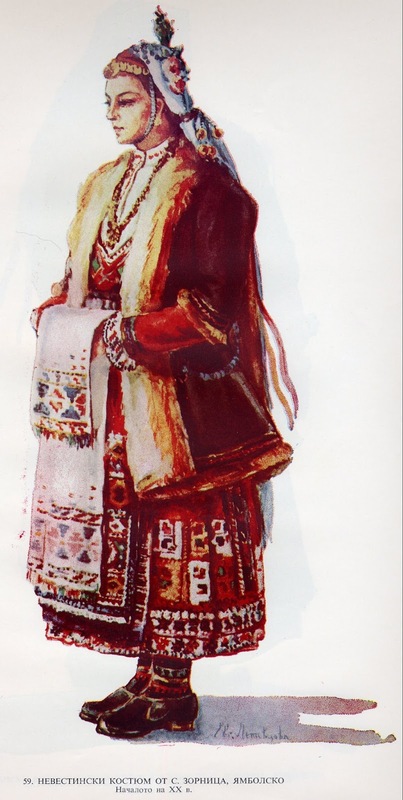 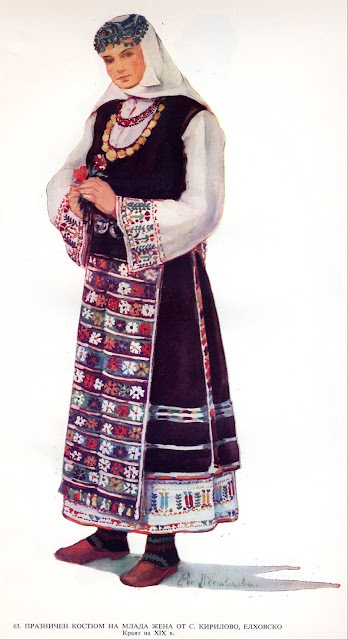 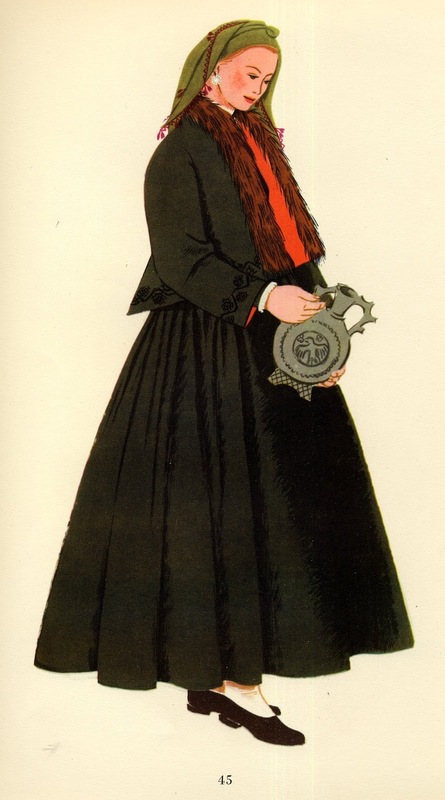 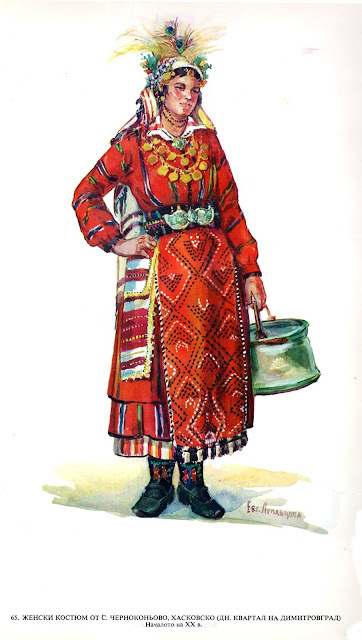 Today I am going to talk about the costumes of the Bulgarian region of Thrace, or Trakiya. Thrace was originally a Greek word which referred a rather vague region which was north of Thessaly and east of Macedonia. 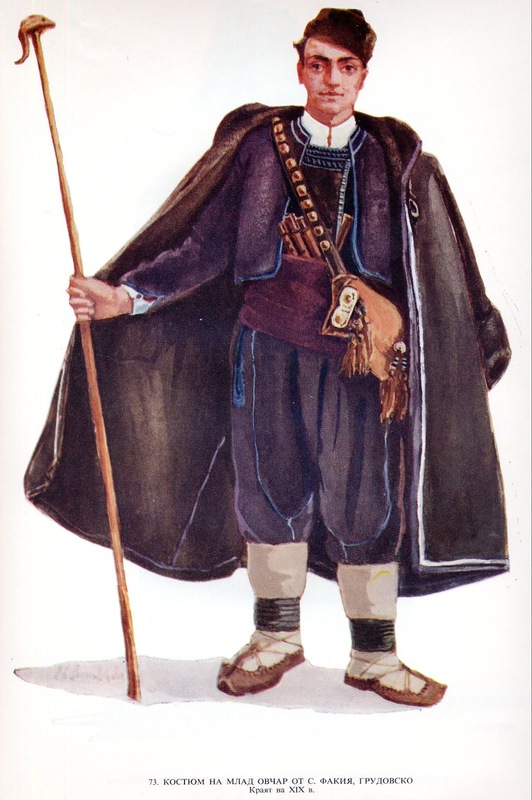 They called the 'barbarian' tribes who lived there Thracians. 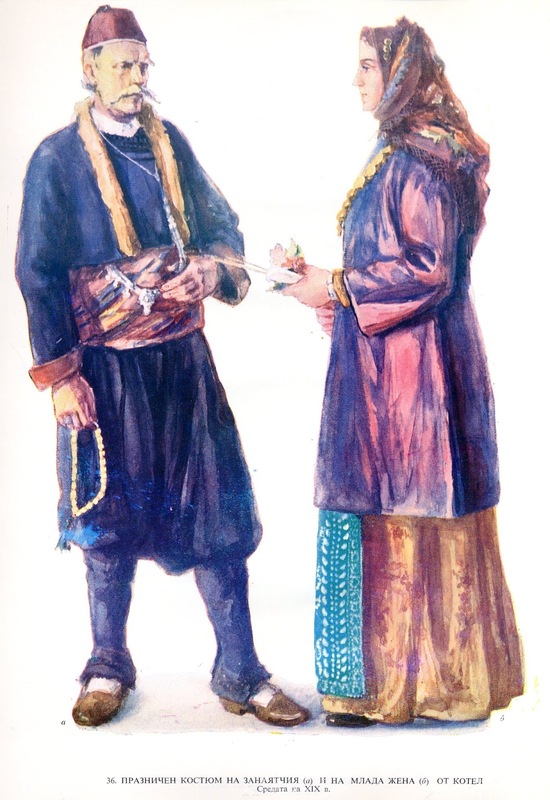 We do not know what they called themselves. 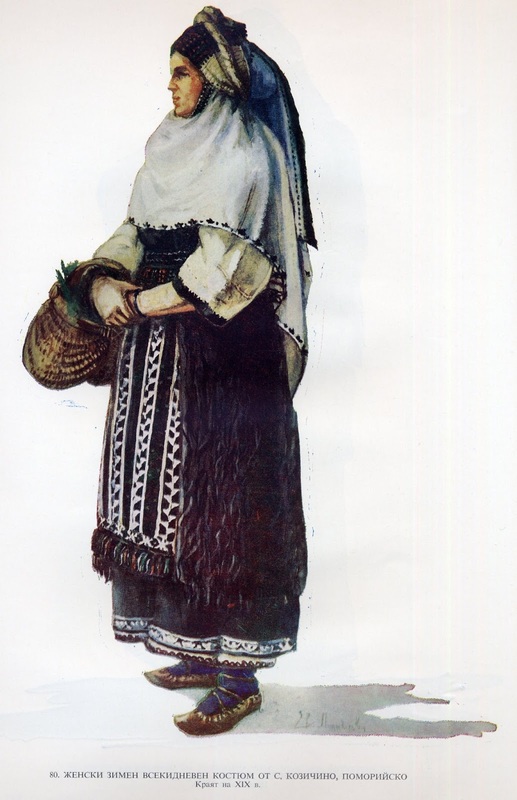 It is generally accepted that the Thracians contributed to the ethnogenesis of the Bulgarian people, together with Slavs and Bolgars. 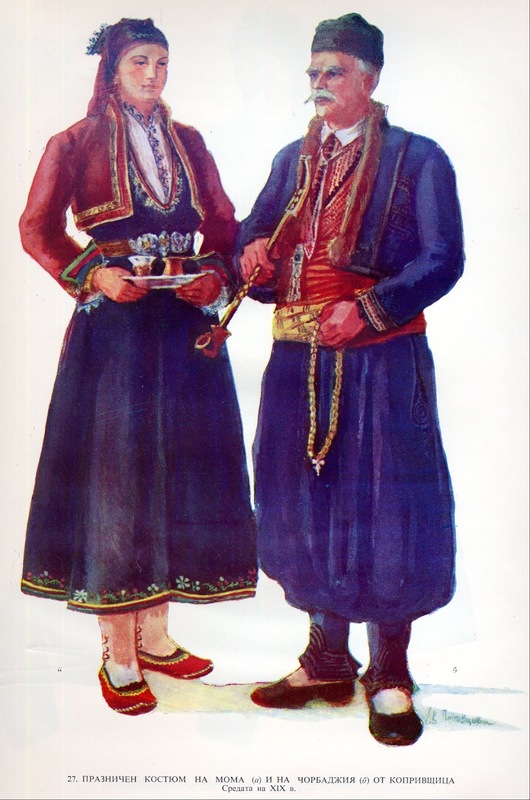 Today Thrace is generally considered to consist of the southeastern Balkans, including the European part of Turkey, northeastern Greece, and southeastern Bulgaria. 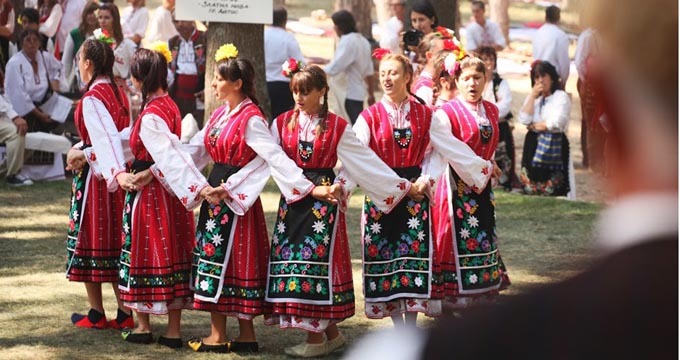 The Bulgarian cultural region of Thrace consists of the lowlands between the Balkan mountains on the north, the Rhodope mountains on the south, and the Black Sea on the east. 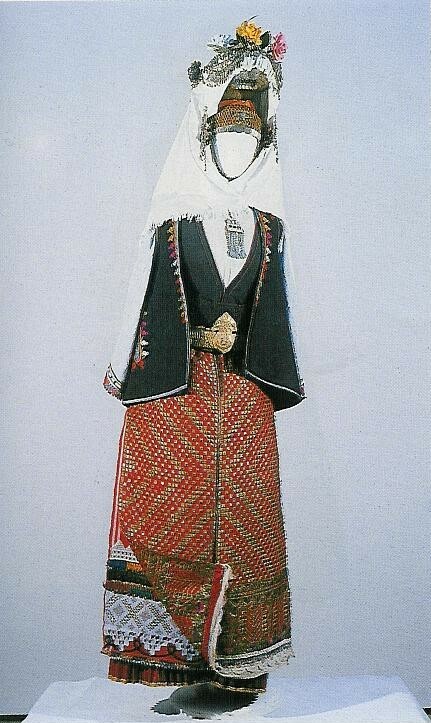 For the most part, the women's costume of Thrace is that of the Sukman, a black wool outer garment which pulls over the head. 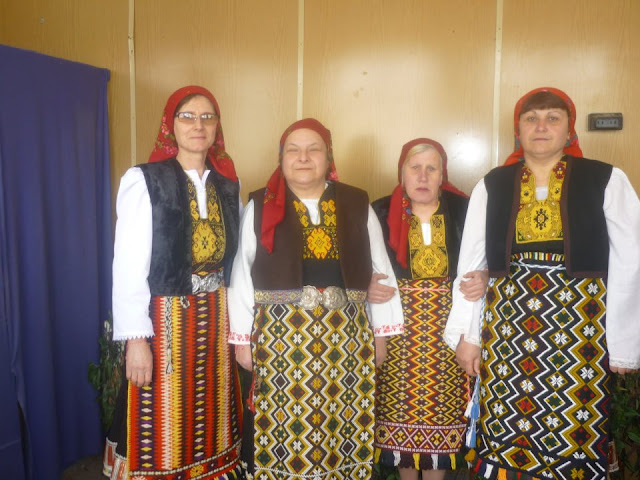 You can see these in the image at the head of the article; this is a group from around Elkhovo. In the south there are some regions which wear the saya, which is open down the front. 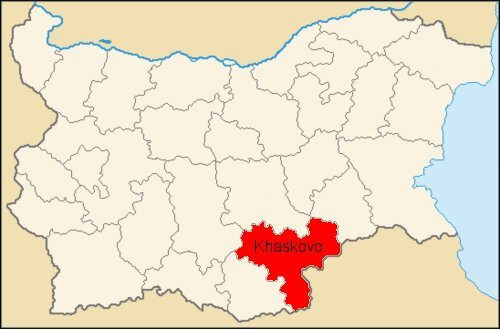 Khaskovo is one example. 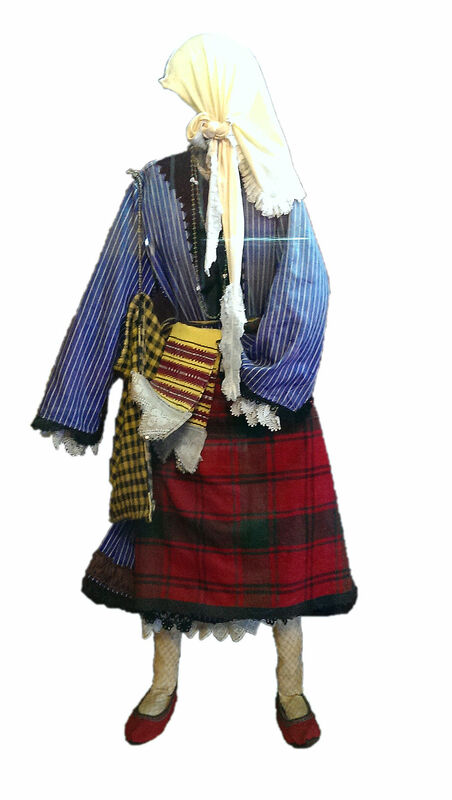 There are also a few towns which developed their own sort of Town costume. These came out of the Bulgarian National revival of the early 20th cent. 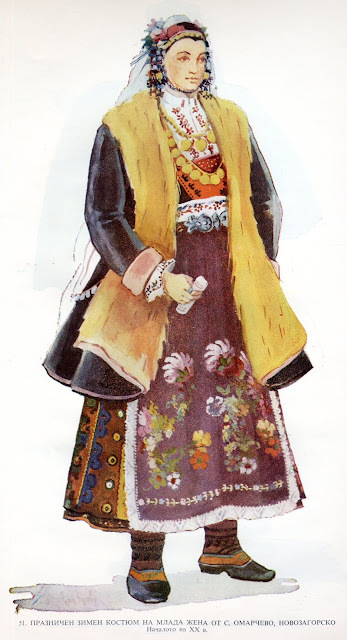 and show influence from both European and Turkish fashion. I will start with these. 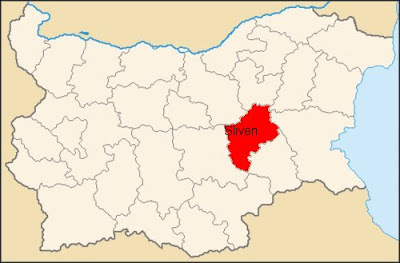 This town is in the north of Sliven oblast, not far from the borders of Shumen oblast, where they also have a couple of town costumes. 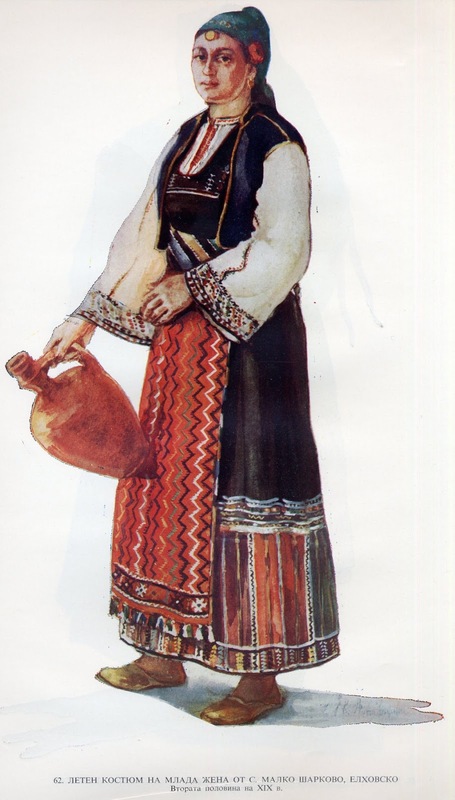 This town is in a peninsula-like eastern extension of Sofia oblast, but is part of the Thracian cultural region. 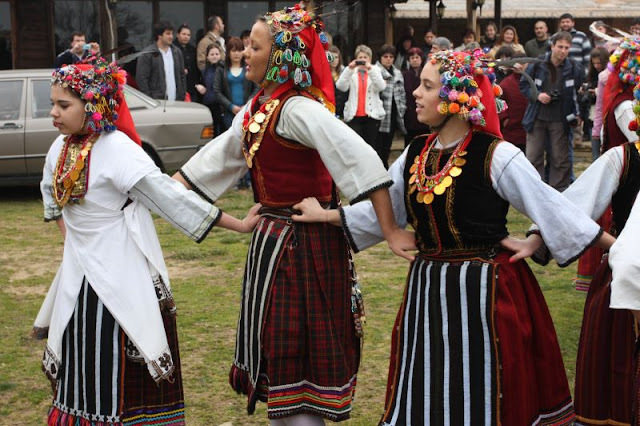 It is best known for the pan Bulgarian folk festival which is held there every four years. 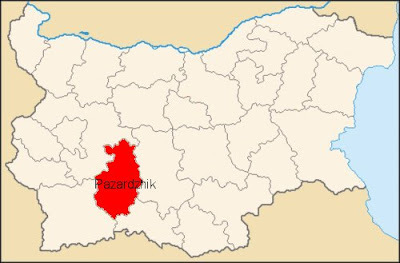 This town is in the north of Pazardzhik oblast, not very far from Koprivshtitsa. 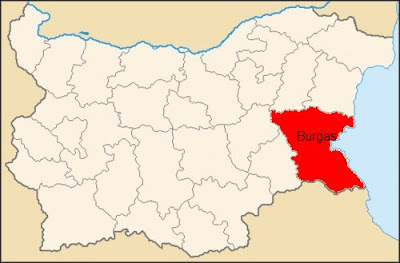 This is the westernmost part of Bulgarian Thrace. 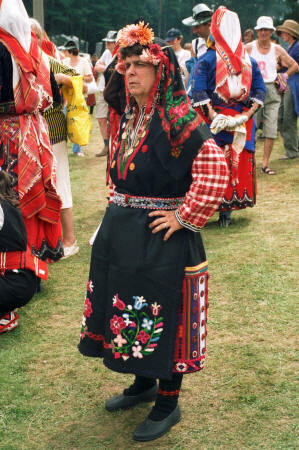 The southern tip of this oblast is really part of the Rhodope region. 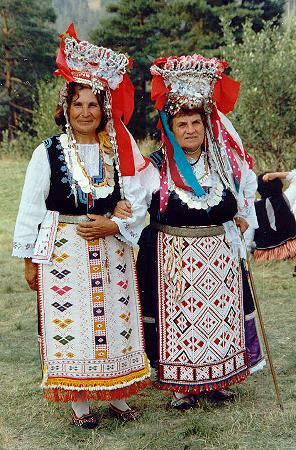 These two are from the village of Buta. 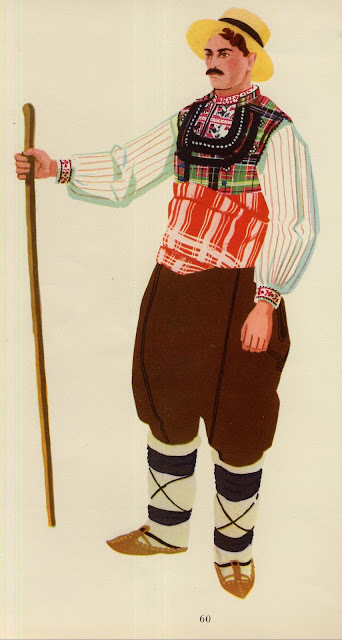 These are more modern style summer clothing. Winter costume from the village of Voynyagovo near Karlovo. 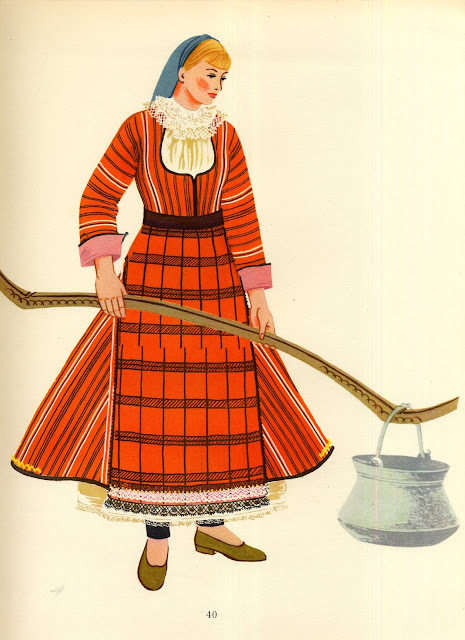 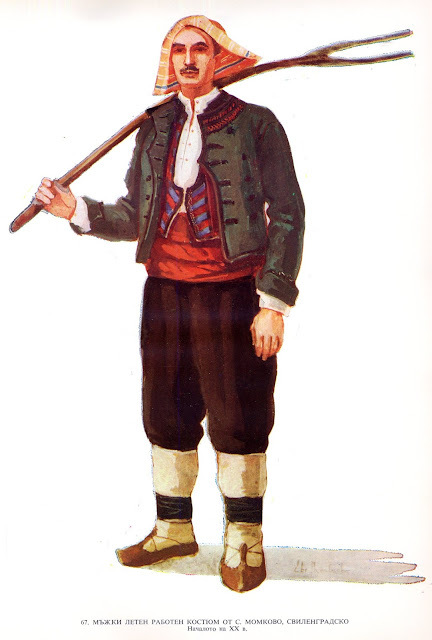 Summer work clothes from the village of Vasyl Levski near Karlovo. 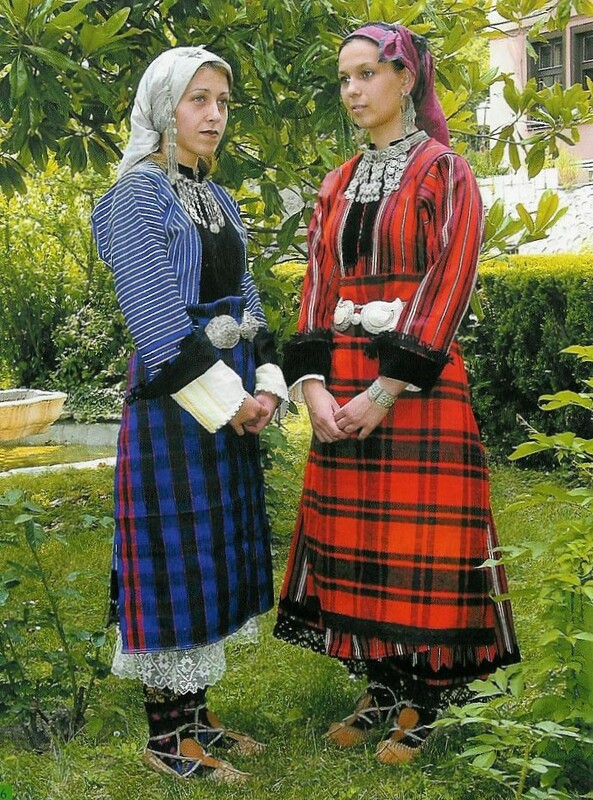 In the southern part of Plovdiv province, they wear the saya costume, rather than the sukman. These are from around the town of Prvomay. 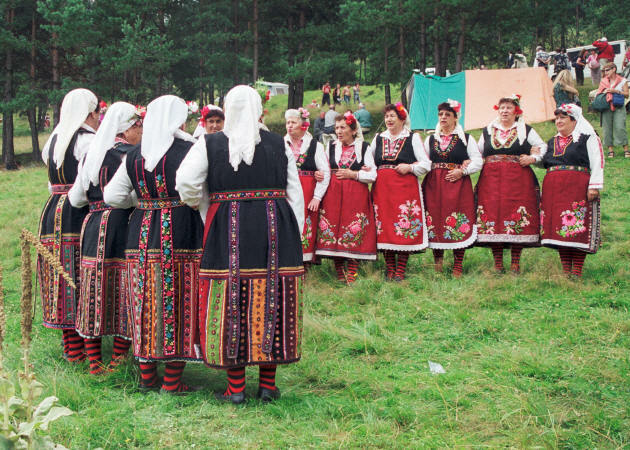 Here is a dance performance called 'Thracian Motifs'. 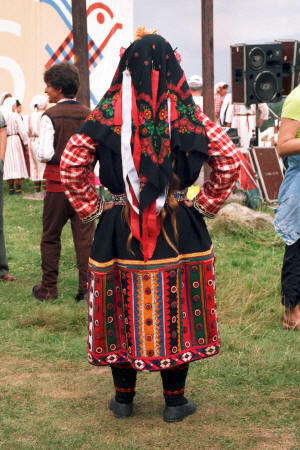 It is performed in this costume, from Vinitsa near Prvomai. 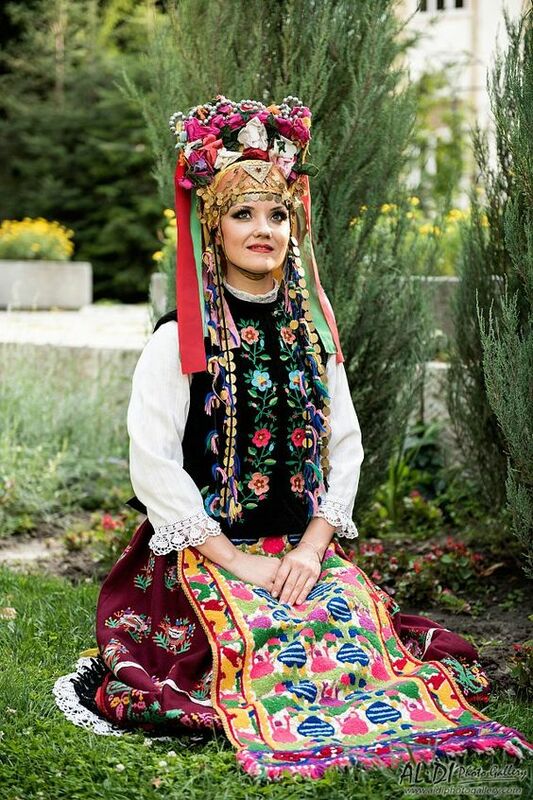 Again, in the north of Stara Zagora province, the sukman type costume is worn. 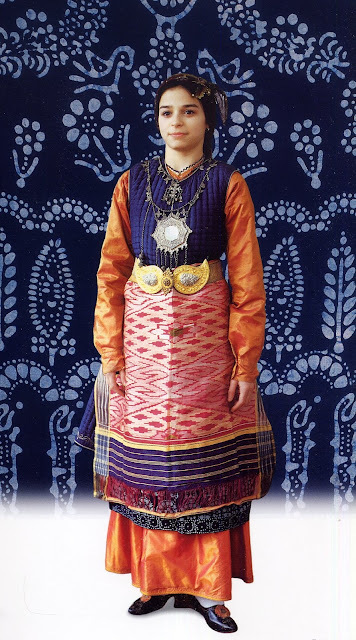 In the south, especially around Chirpan, the saya type costume is worn. 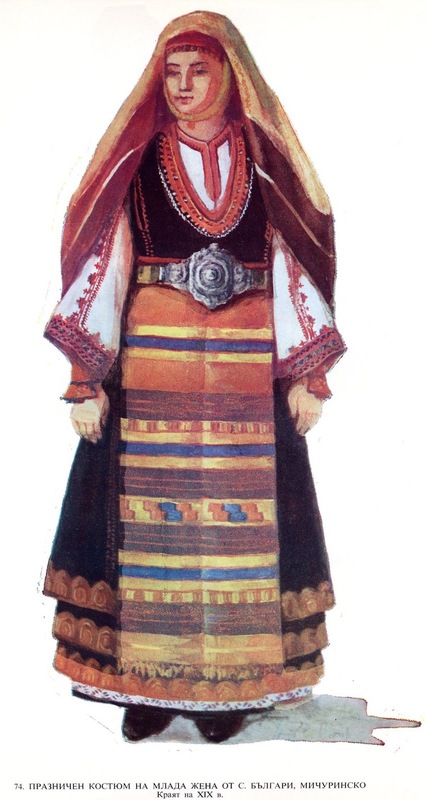 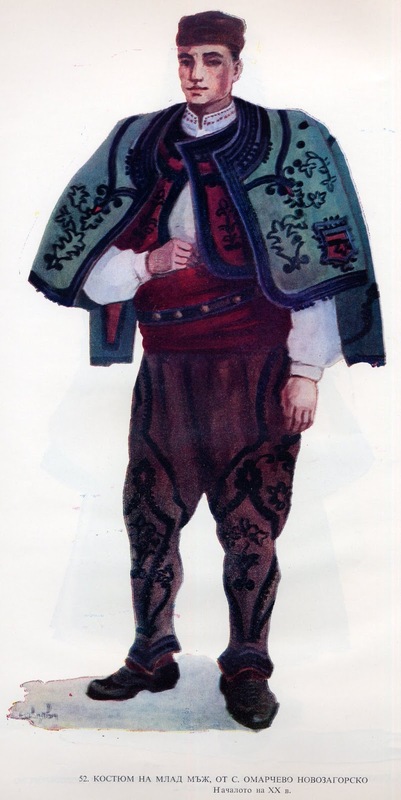 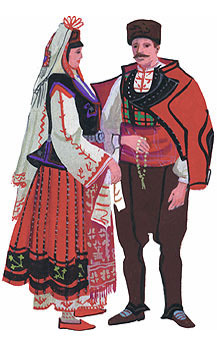 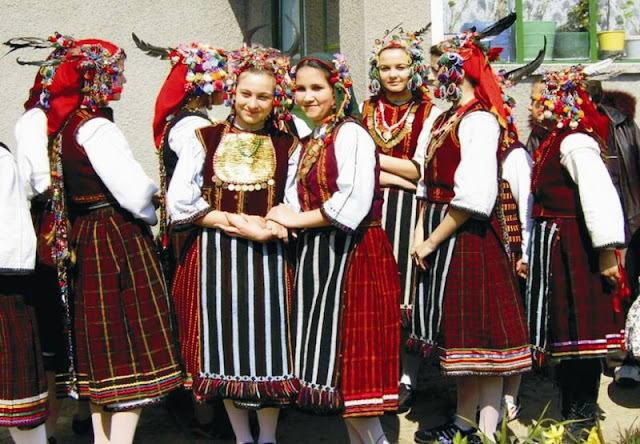 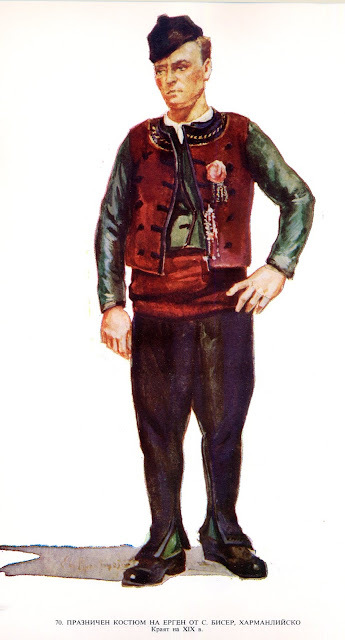 Sliven oblast costumes have some similarities to those of Dobrudja, Varna, and the coastal regions. 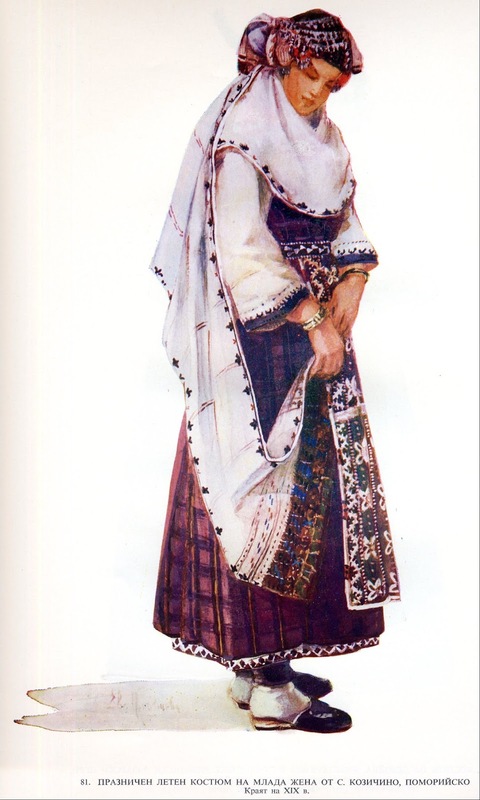 These include highly ornamented aprons, vests, and often the sukman is broken up into a bodice and skirt, sometimes sewn together, and sometimes separate. 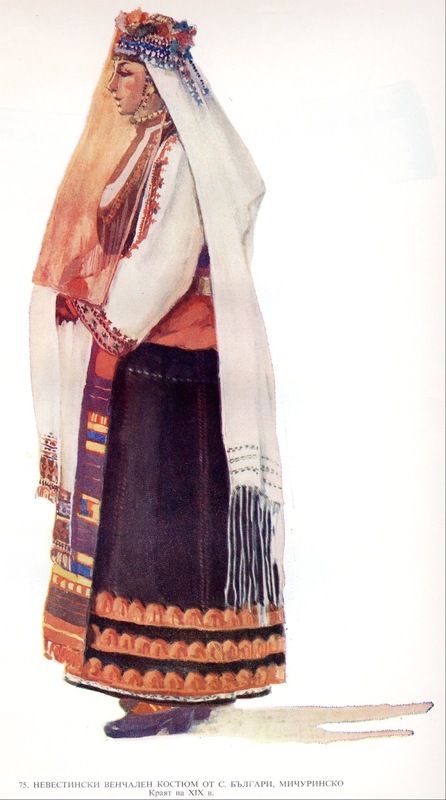 Old costume from Kotel, in the northeast. Kotel later developed a town costume; see the beginning of the article. In both of the above videos, the girls are wearing more modern costumes with short sukmans which do not let the hem of the chemise show. This is undoubtedy from the influence of modern fashion. 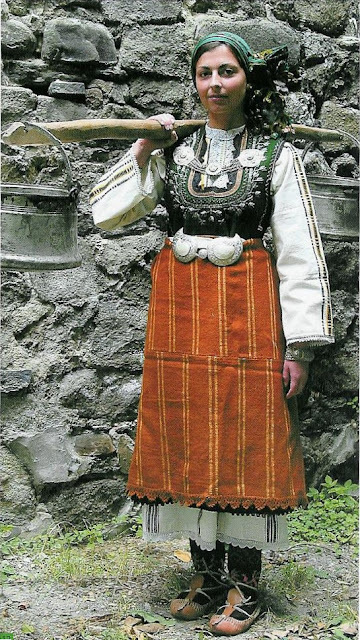 Karnobat in the northwest. 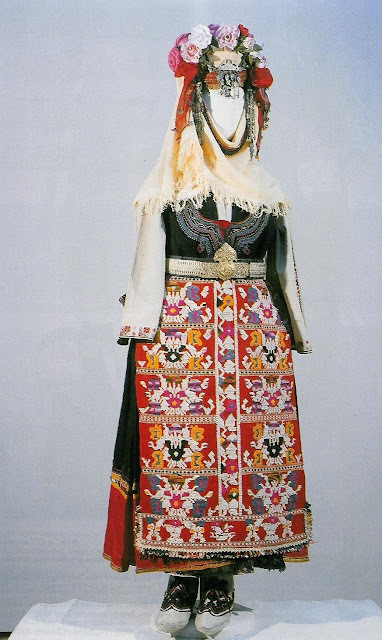 The bridal costume was typified by the high headdress. 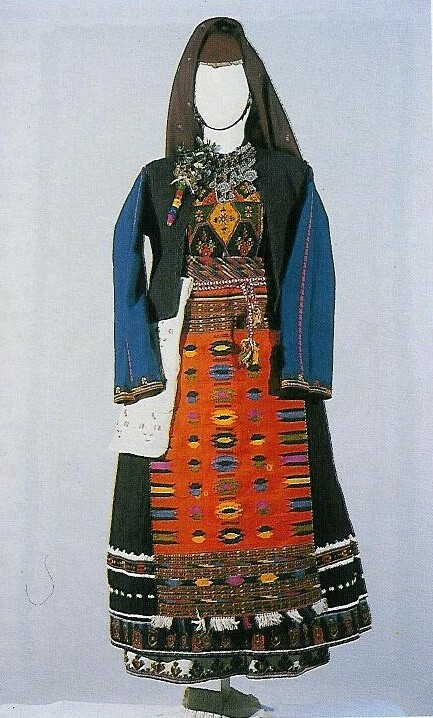 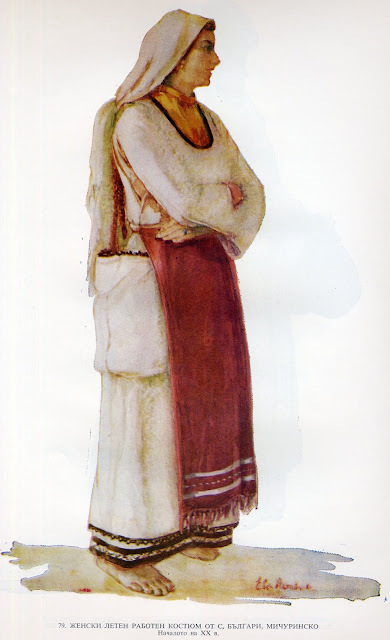 This is the Lazarka costume from Kozichino or Erkech. 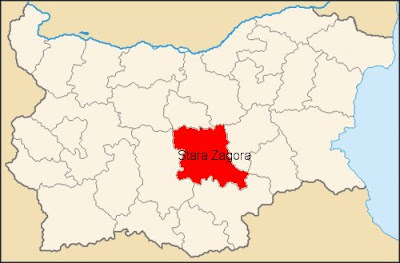 In the south, Strandzha region, although some consider Strandzha to include the entire coastal area up to Dobrich oblast. 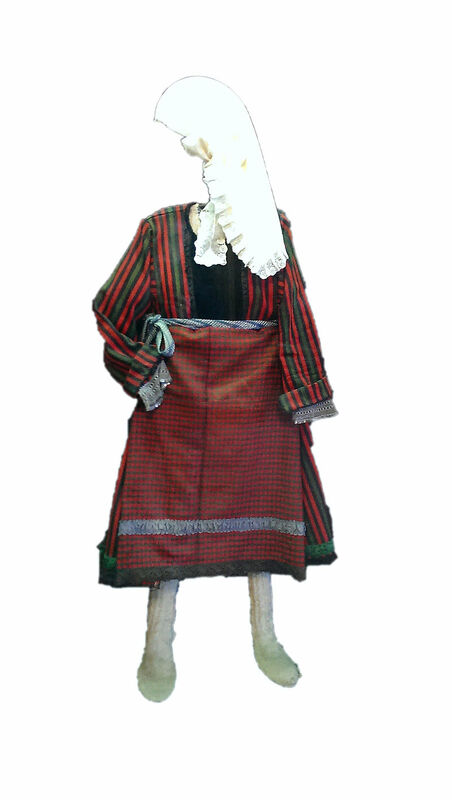 In this area they sometimes layer up to three sukmans at a time. 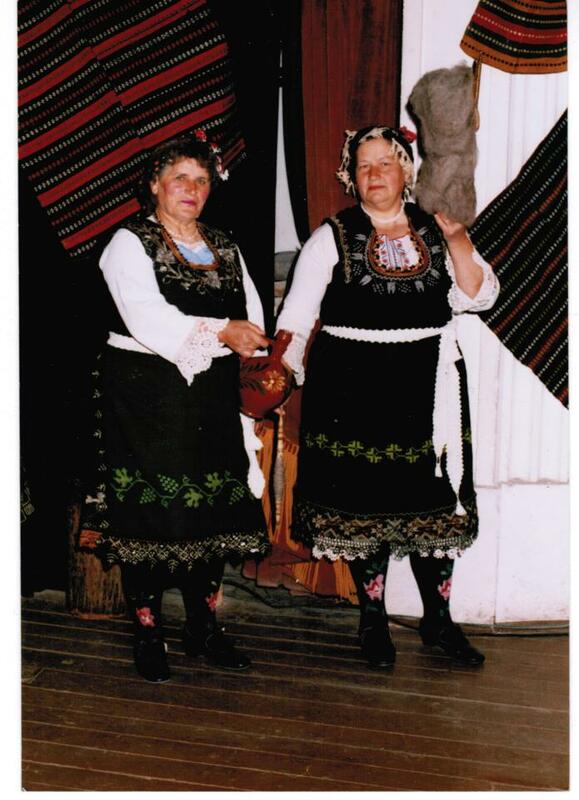 This is the section of 'This is Bulgaria' which features Strandzha. 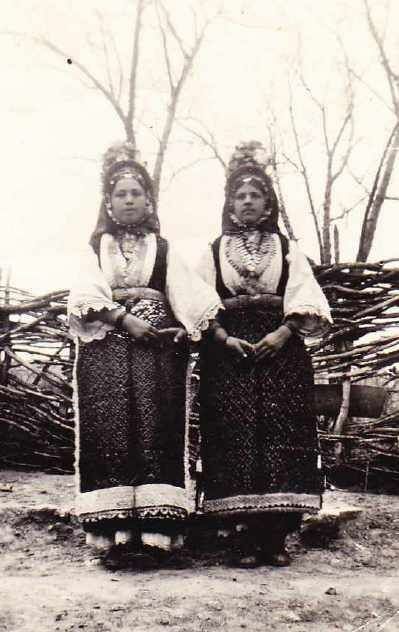 It shows the Nestinari, the traditional fire-walkers of Bulgaria. It also plays out a drama involving a woman who is shunned by the community, her baby, and a man who is presumably the father. 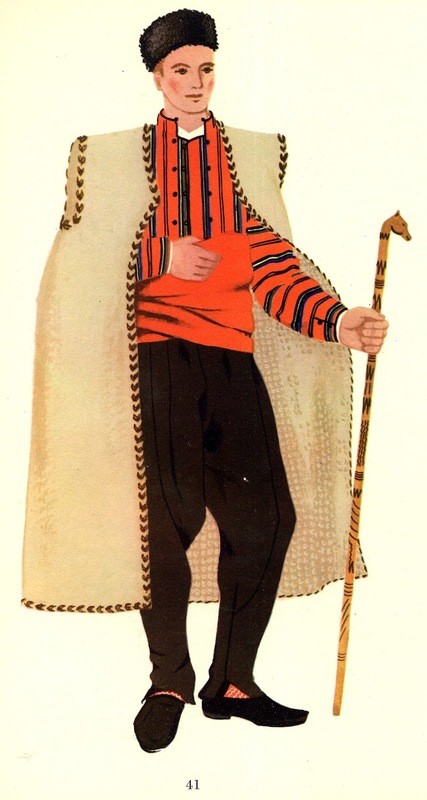 I admit to being unsure as to what exactly is going on. 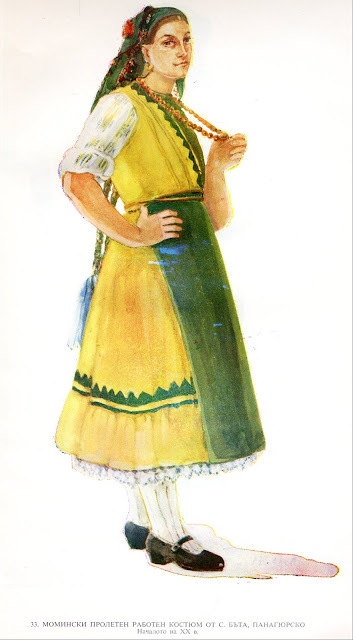 It also features some dancing and wrestling. 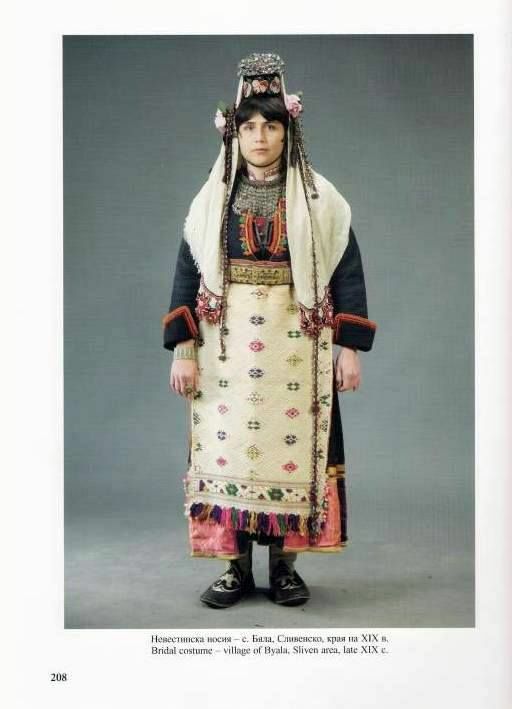 A part of a movie caled This is Bulgaria. 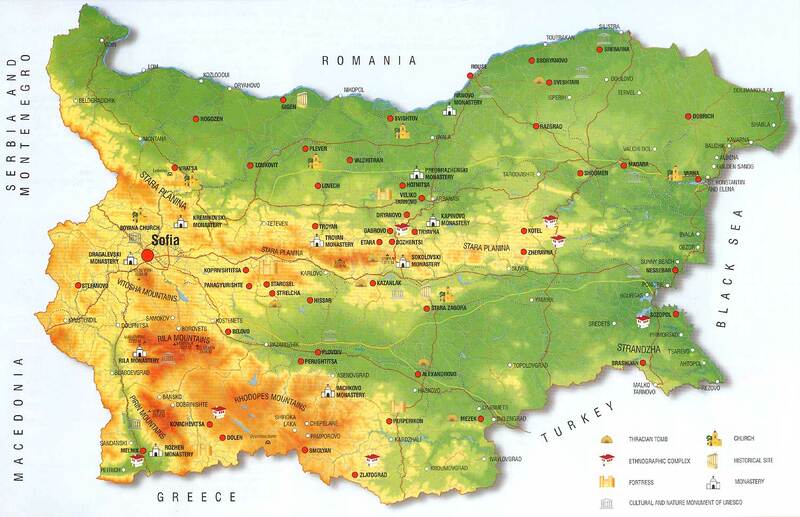 This part features Thrace, specifically the region of Yambol. 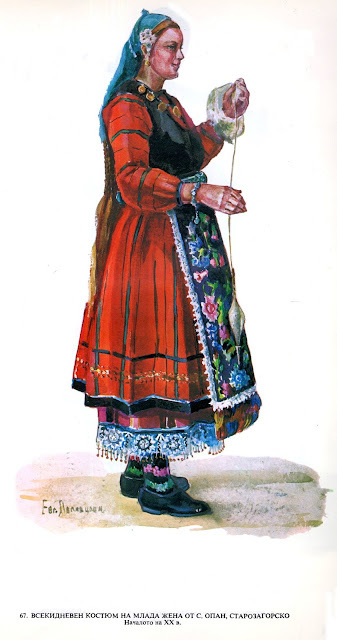 They start with Koledari, men singing carols, then they switch to spring. 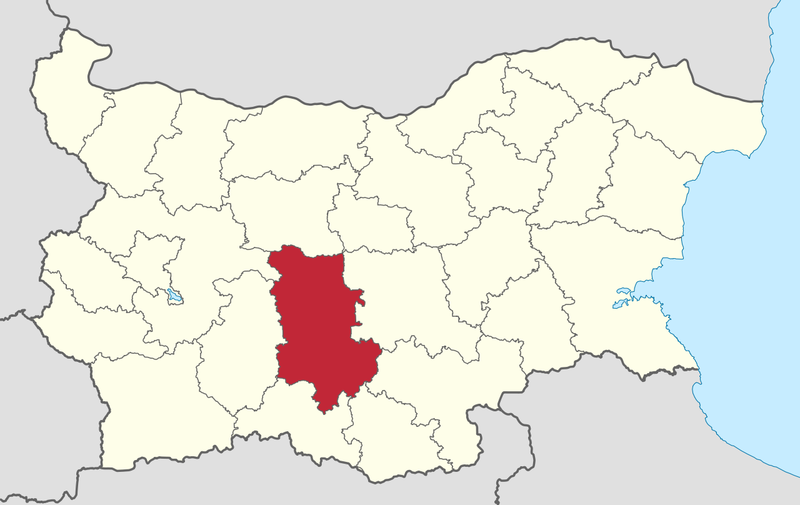 Yambol, or Jambol, is in the north of this province. These are from Zornitsa, which today is just over the border in Burgas oblast. 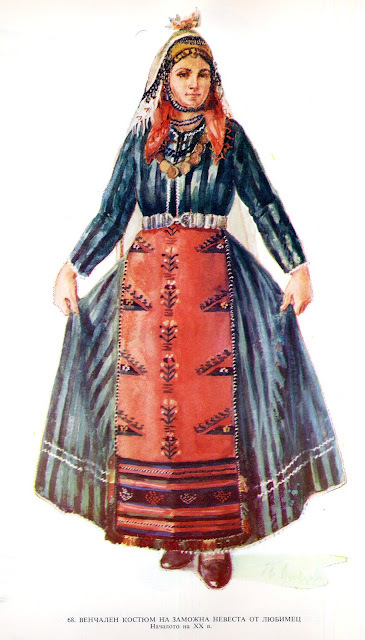 Here is the Bulgarian dance group Trakiya, this is an entire concert, but the first number is done in a costume from this area, followed by a dance from Pirin, a song from the Rhodoopes, A dance from Khaskovo, some singers in Karnobat costume, men dancing in southern Thracian costume, more songs and then Shope songs and dances with dancers in Sofia, Kjustendil, and Ikhtiman costumes and also military uniforms, another song, then a Thracian finale in Burgas costumes. 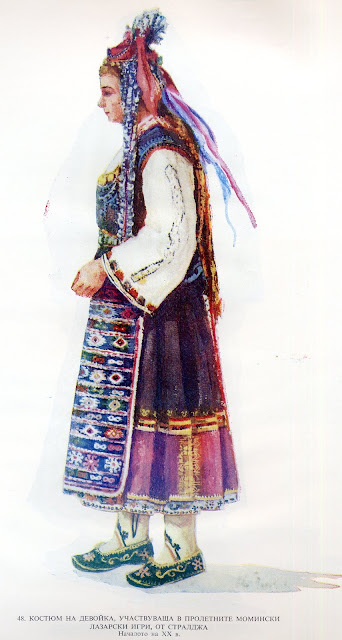 In the south is Elkhovo, where they use cross stitch embroidery around the front opening of the sukman in warm light colors. 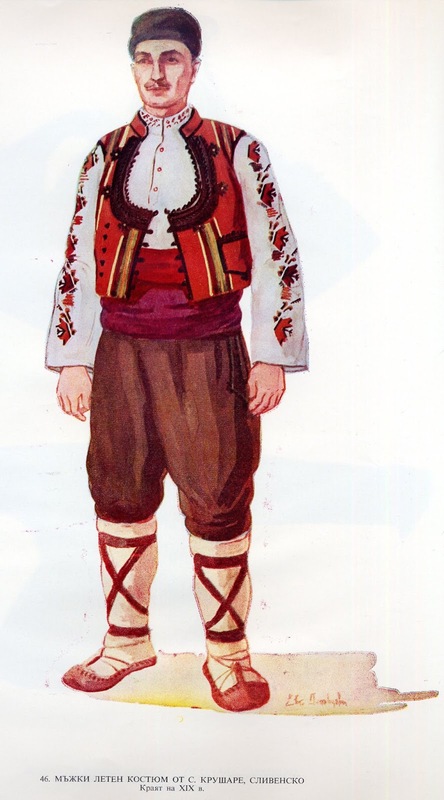 This is not found in the older costumes. 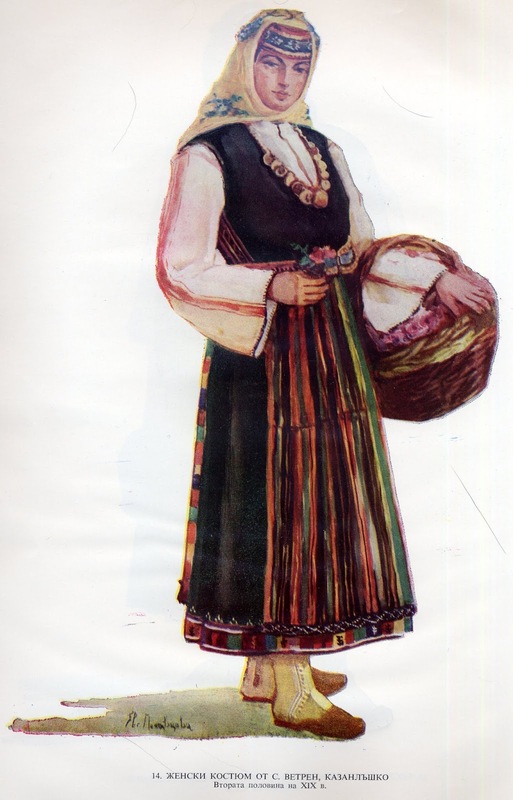 Parts of this province use the saya costume, being in the south of Bulgaria. 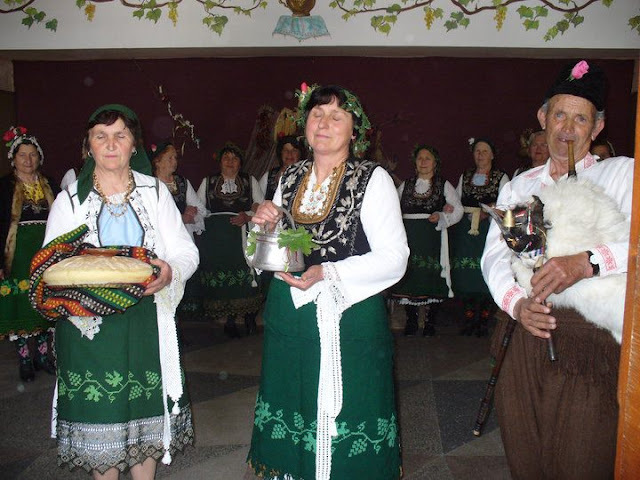 the southern extension is often considered to be part of the Rhodope region. 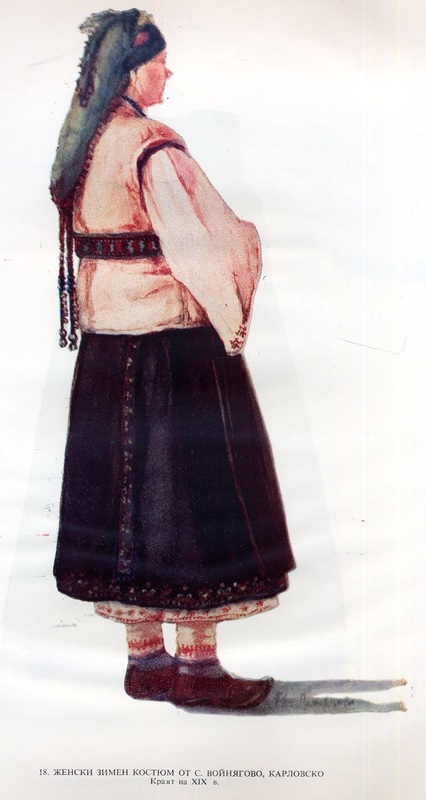 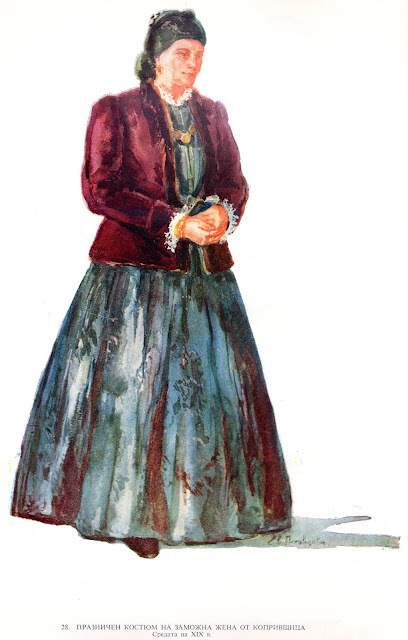 This is a bride from Lyubimets, here again we see elements of city costume. The culture of Thrace is as fascinating and interesting as that of the rest of Bulgaria. 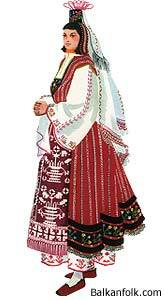 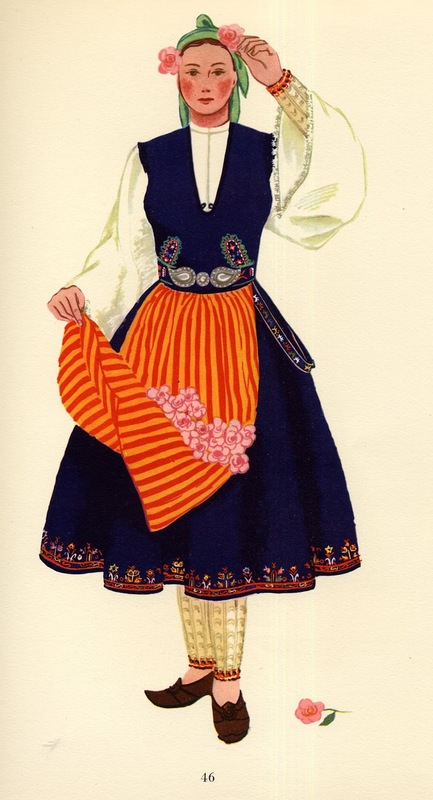 Very wonderful, thank you for taking the time and doing the research to provide all of our folk costume. Cheers from Bulgaria!